Since moving into our Sheffield home over 7 months ago, I've been observing how the sunlight and shade moves over my back garden, photographing it and thinking about the final layout for the design of the back garden. The garden is East-facing, which means the left side, next to the garage, is South-facing and gets light all year around. The right side, North-facing, gets no direct sunlight between October and March, and different amounts of sunlight between April and September. The back end (West-facing) gains the afternoon sun to varying degrees all year around, and the conservatory end (house, East-facing) gets morning to mid-afternoon sun (again to varying degrees) all year around. In respect of the shade throughout the garden during any part of the year, this is light shade. 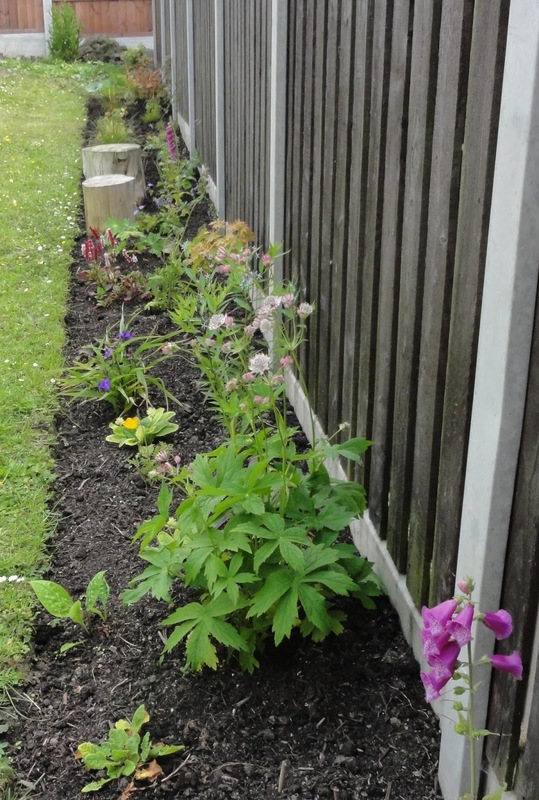 This means the taller plants are, the less likely they will be fully shaded unless they are quite close and low down next to the right-side fence. This is an important point, which I'll explain further below when I get to the new vegetable beds. 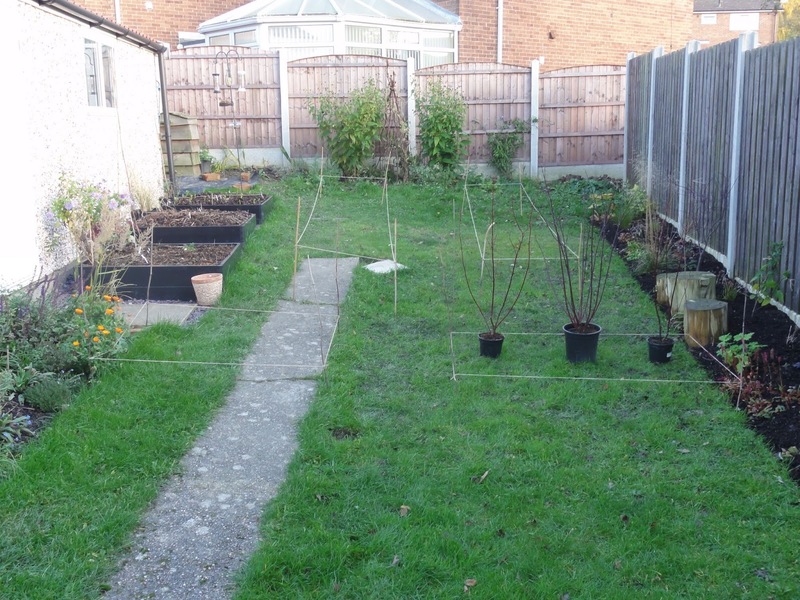 My aim is to have a small kitchen garden, along with borders for perennials and herbs and a couple of fruit trees, within the above aspect constraints. 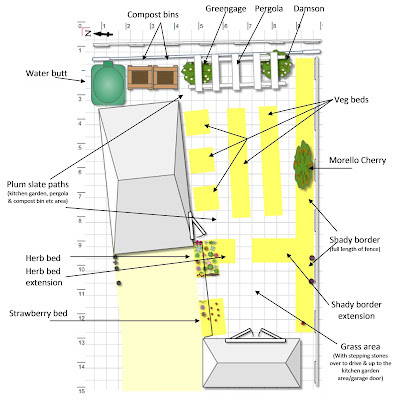 So my observation and thinking was around how I could achieve this, maximising what I can grow in a small urban garden. 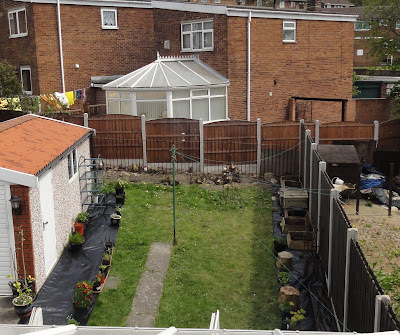 The first thing I did was get the leylandii removed from along the back fence removed. Luckily,the large leylandii in the neighbours house behind us was removed a week later and this immediately let more light into the garden. From then on I photographed how the garden looked at different times of day over the following months. 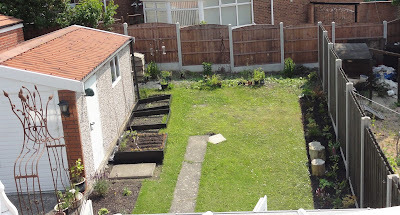 By June-July I had got the initial layout decided, the first borders dug out and some plants were getting established, including one vegetable bed. 11:06am, 5th July, with initial beds laid out. Now it is November, coming up to 8 months since we moved in. After all these months of observation during different seasons I now have a strong idea of how to make the most of my small urban garden. I realise that permaculture practise advises you to make your observations over a year rather than 7-8 months. However, we viewed the house and garden in November of 2012 and saw it a couple of times during December 2012 and January 2013, so I have a pretty good idea of how much the light will change over the late Autumn, Winter and early Spring periods. I also admit that I'm desperately feeling the need to get the rest of the beds down so I am ready next Spring for the start of the vegetable growing season! 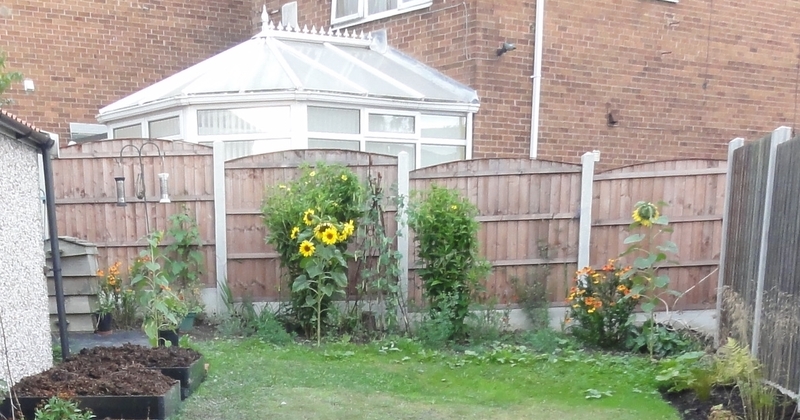 Vegetable border next to the garage, 30cms high, getting direct sun all year around. 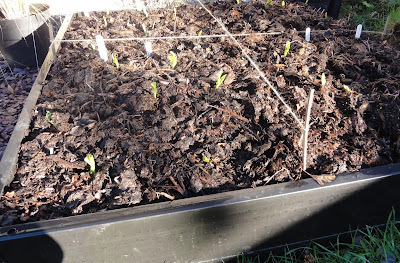 Currently containing a mix of garlic and autumn-winter broad beans. So I have been pondering how to make the most of the small space and its varying sunshine and shade. Of prime importance is having a kitchen garden, everything else comes after that. Deciding how to layout the remaining vegetable beds came first. It is clear that the South & West facing parts of the garden get the most sun for the longest period of time, at ground level. The ground level issue is important, as I discovered if I stood in a 'shady' section when it was sunny in mid-October, it was only shady for the first 30cms. 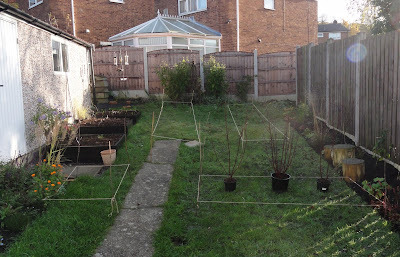 So, if I build up my vegetable beds to be at least 30cms high, the vegetable beds will get sun for a longer period of time, from earlier March and into late October, not just April to September. Those few extra weeks can make a difference when you are growing vegetables! c) it's means less leaning and therefore is better for my back. I've also (roughly) calculated that because of the way the light moves around the garden, the higher beds shouldn't particularly impact on either the shady border, which gets morning to lunchtime light from the East. And the South-facing beds next to the garage should be further enough away (the path between them will be c. 70-80cms) to not be shaded during the cooler months. Shade in the summer months is not an issue as the sun is so high in the sky. 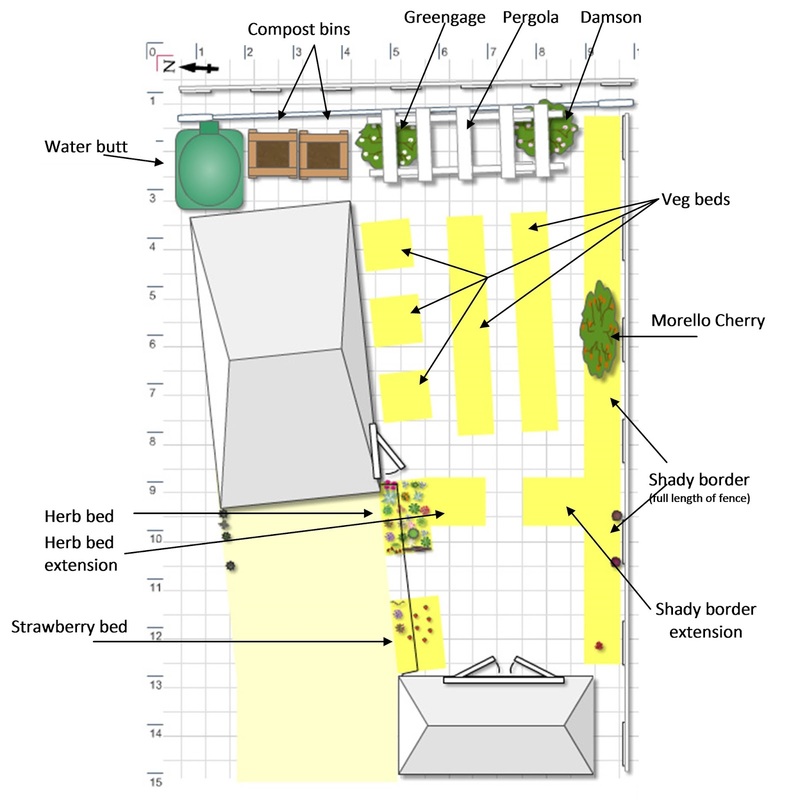 Whilst this plan basically works, I was slightly bugged that from the conservatory doors, there would be a direct view from the doors to the back fence, i.e. nothing breaking up the view to give you a sense wanting to explore different areas of the garden. And whilst I don't have much space to really create 'garden rooms' given my criteria, I would like the path you view and walk to wind a little bit(!). However, thinking of natural ley lines, I don't want to create something too windy that would end up being a pain to walk along day-to-day. I will be adding stepping stones as a path in the grass from the conservatory doors to the driveway, and up to the kitchen garden area, which will have plum slate paths. It's the latter that is more important from a natural ley lines perspective, as I don't want too much fuss getting from the house to the compost bins on a regular basis. This gives me a slightly skewed view from the house (not a direct line to the back of the garden as one of the veg beds will act as a slight barrier. But it also gives me a fairly direct path from the house up to the compost bins. 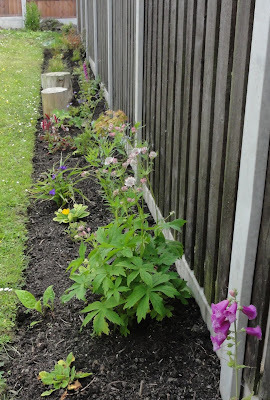 It has meant I've had to sacrifice a little bit off the herb bed extension, where I wanted to place more sun-loving perennials. I'll just to have to grow more part-shade loving plants - what a shame...! The grass area, which gets a bit more shade in the summer than the rest of the garden, when you want to sit outside, is next to the house. This makes it easy to access to use, as is the herb border for picking herbs fresh for cooking. I originally thought of putting chairs and tables under the pergola but realised that it would be too hot in summer to sit there, and also, being further from the house we might not end up using it so much. So instead I will put a chair under the pergola, where I also plan on adding a grape vine to grow over it next year. I will obtain some chairs and tables for the grass area, that can be folded away when they aren't needed or for when you want to sit on the grass. but I cannot put the stakes in concrete! Overall, I'm hoping that it will be both functional and attractive. 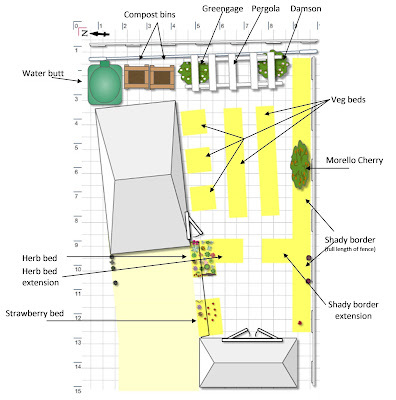 I believe this layout maximises the use of the areas that get the most sun for the kitchen garden, and gives me plenty to play with in terms of adding perennials, bulbs and other flowers and shrubs. I have already planted a couple of smaller trees, Acer palmatum 'Bloodgood' and Acer palmatum 'Sango-kaku' in the shady border. The only 'larger' trees I'm adding to the garden are fruit trees, specifically Greengage 'Denniston's Superb', Damson Shropshire Prune and Morello Cherry. I'm also placing Quince Leskovacz in the front garden. Veg beds against the large South-facing garage wall. I haven't forgotten that there is all that vertical South-facing space that is the garage wall! 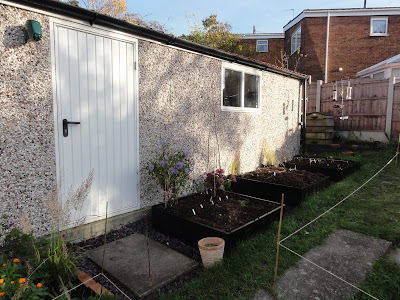 The reason for spacing the veg beds out out rather than making one long bed, is that I plan on needing access to the garage wall; I'm going to turn it into a kind of greenhouse space. I'm still working through the exact details (shelving, supports, glass or clear plastic for greenhouse warmth etc), but I knew I wanted to make the most of this warm space, hence planned the paths and access from the start. Finally, before anyone says "what about all that space at the the back fence", well unfortunately, it's not that simple. 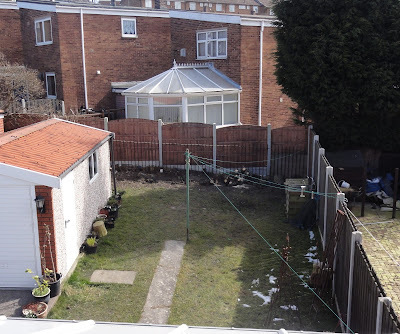 When we got the leylandii removed upon moving in, we found we had not one but two back fences, and a massive immovable block of concrete wedged in between them. We eventually found out that a stupid contractor used by the previous owners of the house had a large amount of concrete in it's liquid form left over from when he had finished the driveway. And guess what he did with it. Argh! The neighbours living behind our house obviously decided to put up a new fence, the old fence being steel railings which mean everyone could see into each others garden and conservatory. 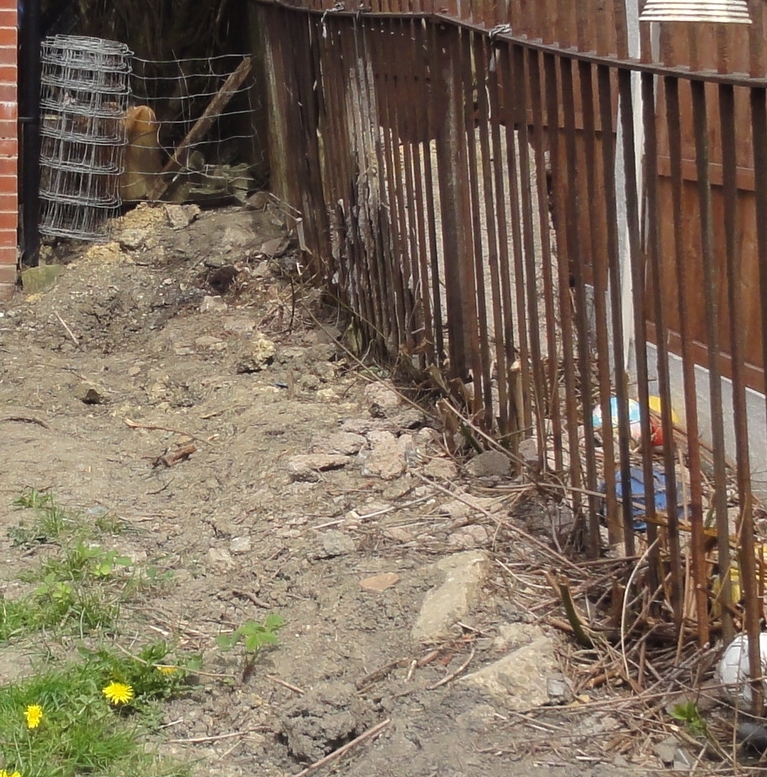 The concrete block was actually on their side of the fence and they decided not to bother with it and just build the new fence in front of it. Well, that's one solution, but it means that I now have about 30cms of their land on my side of their fence. 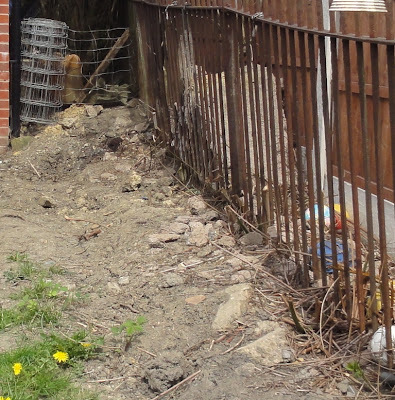 I took advice from the council and spoke to the neighbour, and what I need to do is not put anything permanent on their land. The neighbour isn't particularly worried about it, but you never know who may buy the house in the future and I don't want a 30cm boundary dispute in the future! 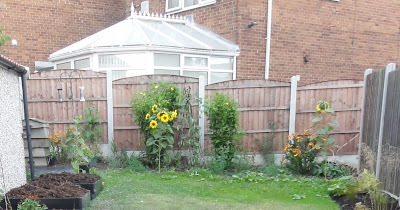 So I'm building my pergola within the border where the steel railing fence was, and sowing wildflowers and adding some perennials into the 'neighbours land'. These plants can be easily removed if need be in the future. 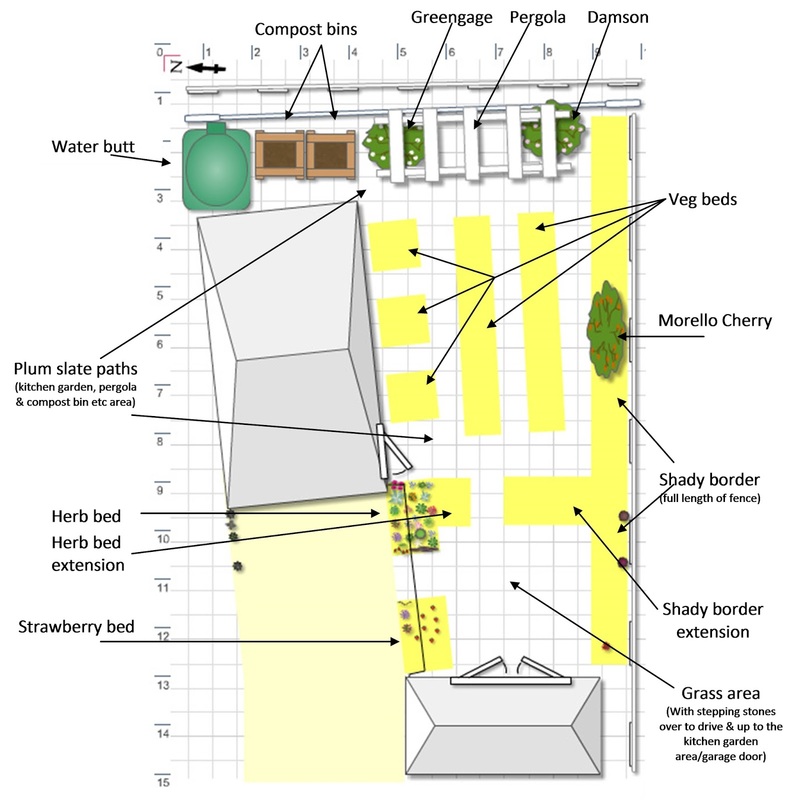 Once the pergola is up, that should both define the boundaries clearly, and once the grapevine gets growing, it should hopefully mean that it creates a screen between our garden and the neighbours, so we both have more privacy and aren't constantly looking into each others garden and conservatories. So, decision made, that's the plan! Now, the work... After some angst I finally have found a landscape man to do the, well, landscaping. All the grass is coming up, grit etc will be added for aeration, before putting down the membrane then slate paths in the kitchen garden, and new turf for the grass area. 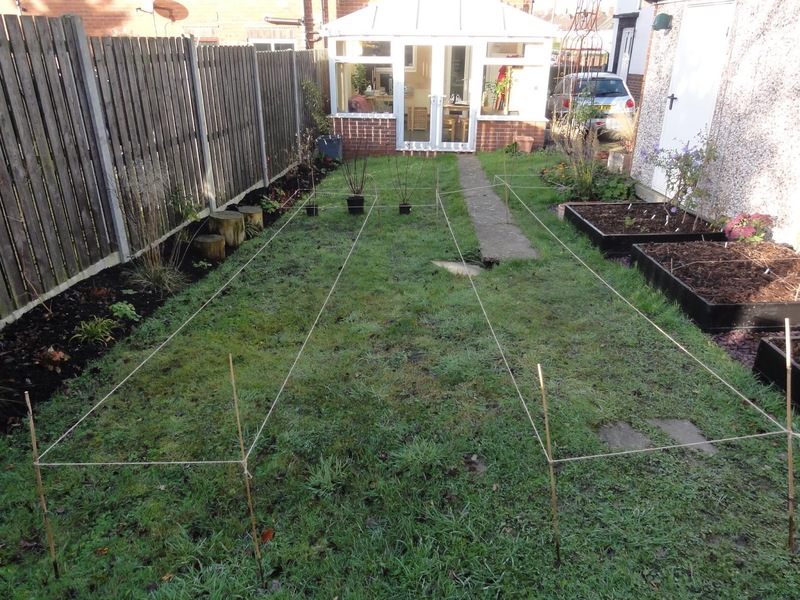 He is also going to add in railway sleepers both as a small retaining wall and to create a step or two up to the pergola and compost areas, and he is going to build the simple pergola to my specifications. Subject to the weather holding, work starts in December. This blog is probably rather heavy on detail regarding the light and shade issue and how to place things, and I'm not sure it will be of interest to many people. Writing it has been really useful to me as I can recheck all my thinking and see how I came to the decisions I've made. If it is useful for other people, or you see something I've missed that you can tell me about, even better! Good idea - thanks Helen! I remember seeing the first 1 or 2 photos just after your move. The layouts look good and don't worry about the light & shade details being "heavy", its still important to different plants that will be growing in it. Thanks for your comment Linda. Re east-facing - it can depend on several factors, such as how tall/high the houses around you are (i.e. are they standard ground & 1st floor, or do they have a 2nd/3rd floor? 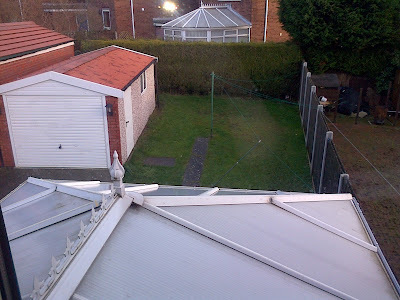 - the more floors in the neighbours house, the less light in your garden overall), are there any large trees, hedges or shrubs in your neighbours garden that may affect the light your garden received, the kind of fences surrounding your property, etc. If the neighbours have tall trees etc, then that's out of your control. You can talk to them about reducing the height, but it is something that will have to be managed year on year. What I came up with for my east-facing garden was based on 10 months of observation. At a rough guess (and this is only if you don't have houses, trees etc blocking the light), you will get quite a lot of light between April-August and between the hours of c. 8am-3-4pm. So look at the height of houses, trees etc around you before deciding if you want to go ahead. Hope this helps.